Sudden sensorineural hearing loss, or sudden nerve deafness, is a medical emergency. A typical patient loses his or her hearing in one ear over a period of one to several days, associated with a feeling of fullness in the ear, and often tinnitus, or ringing of the involved ear. Unfortunately, a number of patients delay seeking care by a specialist. The symptoms of decreased hearing and fullness of the ear are often diagnosed as a middle ear infection (otitis media) and so the referral to an audiologist or otolaryngologist (ENT specialist) is made too late. If you do have sudden sensorineural hearing loss, treatment with steroids within the first 2 weeks of the symptoms provides the best chance that some of the hearing may return. The diagnosis can only be made by specialized hearing testing in a sound-proof chamber by an audiologist. Pure-tone thresholds, speech discrimination scores, acoustic reflex testing, and distortion product otoacoustic emission testing, the parts of a complete audiometric evaluation, are performed to confirm the diagnosis of a sudden sensorineural hearing loss. This comprehensive testing by an audiologist will ensure that the loss is nerve-related, and not due to fluid, infection, or a perforation, or hole in the ear drum. MRI scan of the brain, with gadolinium contrast, is also performed to exclude the presence of a cerebellopontine angle tumor, such as a vestibular schwannoma (acoustic neuroma). 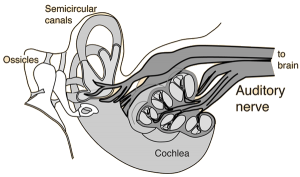 The gold standard treatment for sudden deafness, if caught within two weeks of the onset of the symptoms, is high-dose steroids, taken by mouth. Evidence now suggests that injection of medication into the middle ear, using a relatively painless and quick procedure in the clinic, is also effective in treating sudden sensorineural hearing loss without the side effects that can be seen when taking high-dose steroids by mouth. The National Institute on Deafness and Other Communication Disorders (NIDCD) – National Institutes of Health (NIH) has seven centers nationwide are participating in a 5 year clinical trial (http://www.suddendeafness.org/). This study will compare high dose oral steroids with intratympanic, or middle-ear injections of a special formulation of steroid medication for the treatment of sudden sensorineural hearing loss. This Sudden Sensorineural Hearing Loss Multicenter Treatment Trial is the first prospective, randomized clinical trial to compare these two different treatment options. This multimillion dollar NIDCD/NIH study will provide valuable information to patients, otologists and otolaryngologists, and referring physicians about the most appropriate management of this otologic emergency. If you have any questions about Sudden Sensorineural Hearing Loss and treatment, please feel free to call Dr. Kohan’s office for an appointment (212) 472-1300.